From year to year, the number and strength of storms developing during the Atlantic hurricane season varies. This year, NOAA’s Storm Prediction Center is expecting an average to slightly below average season. In addition to the seasonal outlook, announced at a press conference in New York City, NOAA also unveiled its new storm surge visualization product. Building on the lessons from super-storm Sandy, this new mapping tool will show the storm surge threat to specific communities beginning when a tropical storm or hurricane watch is issued. Hopefully, this will give the public a better understanding of the dangers of storm surge flooding and allow them to make more informed decisions. While the overall number of storms expected to develop this year is relatively low, it is important to remember that it only takes one to cause serious damage, if it makes landfall. Straddling the border of North Carolina and Tennessee, Great Smoky Mountains National Park protects 800 square miles of the southern Appalachian Mountains. It is the largest federally protected upland landmass east of the Mississippi River. Air pollution, however, does not recognize these human-drawn borders. While traveling in the Smokies recently, I learned more about the air quality issues facing this country’s most visited national park. According to the NPS, most of the air pollution impacting the park originates outside its boundaries. Emissions of sulfur dioxide and nitrogen oxides from power plants, factories, and vehicles are the main sources. Carried by wind to the southern Appalachians, the height of the mountains and the prevailing weather patterns of the region tend to trap the pollution in and around the park. Originally named for its naturally occurring smoke-like blue haze, the park in recent years has been shrouded by unnatural white smog. Produced by tiny sulfate particles – released into the air by the burning of fossil fuels – the smog scatters light and reduces visibility. It has degraded views from the park’s scenic mountain overlooks and dulled its signature blue haze. Since 1948, according the NPS, human-made pollution has decreased average visibility in the region by 40% in winter and 80% in summer. Ground level ozone, formed when nitrogen oxides react with heat and U.V. light, is known to have negative impacts on human health. In the Smokies, it is also injuring trees and plants. Damaging leaves, it reduces photosynthesis and limits a plant’s ability to produce and store food. As a result, they are more susceptible to disease, insects, and extreme weather events. Acid rain is another problem for the park that is rooted in air pollution. It develops when sulfur dioxide and nitrogen oxides react with water and oxygen in the atmosphere to form solutions of sulfuric acid and nitric acid. This type of precipitation alters the chemistry of forest soils and streams. It jeopardizes the health of entire ecosystems, as a large array of species – from fish to trees – cannot adapt to the more acidic conditions. The average pH of rainfall in the Smokies, according to the NPS, is 4.5. That is 5–10 times more acidic than the pH range of normal rainfall. Traveling in North Carolina and Tennessee recently, I had the opportunity to visit Great Smoky Mountains National Park. While renowned for its “wondrous biodiversity”, the park’s name is derived from a localized atmospheric phenomenon. The Cherokee, who originally inhabited the area, called the mountains, “Shaconage”, meaning “place of the blue smoke”. It refers to the smoke-like bluish haze that hovers over the park’s rugged peaks and valleys, especially after a rainstorm. According to the NPS, it is a natural by-product of plant transpiration. While all trees and plants exhale water vapor, the conifer trees in the park also emit terpenes – a naturally occurring organic compound. Released in large quantities, the mix of terpenes and moisture react with natural low level ozone molecules to form tiny particles that scatter blue light. As a result, the mountains appear to be bathed in a gauzy blue mist. 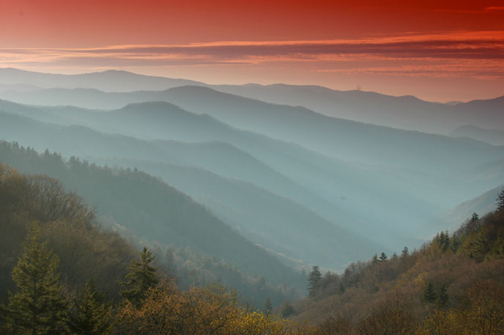 In recent years, according to the NPS, human-made air pollution has been obscuring the Smokies’ signature blue haze. Climate change is a complex subject impacting all aspects of human society. 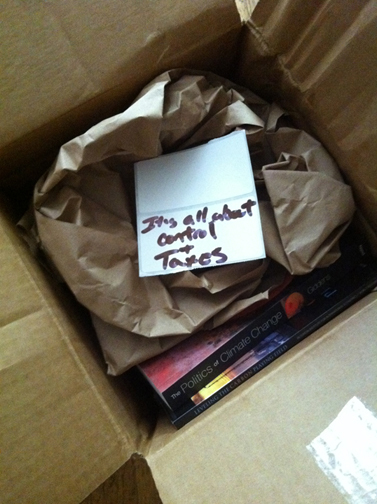 In an effort to better understand the political and economic side of the subject, I recently ordered some books from a well-known e-commerce company. Arriving a few days later, they came with a little something extra. It is no secret that climate change – a scientific issue – has been hijacked by politics and feelings run deep. Nonetheless, in a world with so many forums to share your opinion, I find it strange that someone was so compelled by my choice of books to risk their job by leaving this note. While only a single incident, it hints at how much work needs to be done to build a consensus to address the most pressing environmental issue of our time. 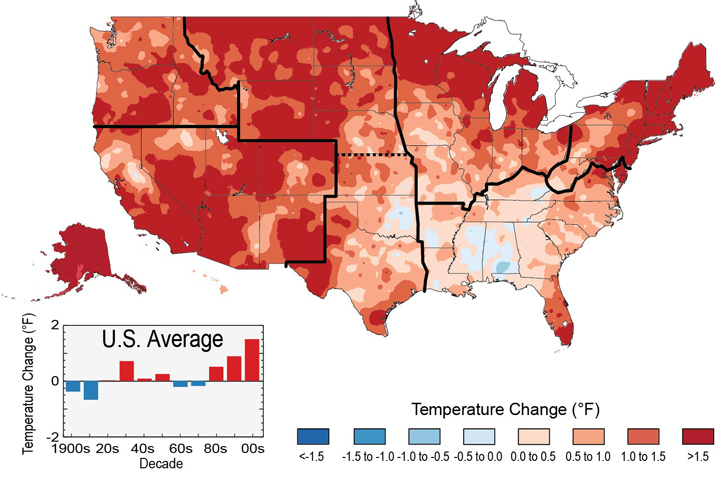 The White House released the third US National Climate Assessment (NCA) report yesterday. It clearly states that climate change is not a distant problem of the future; it is happening now and impacting every region of this country. “U.S average temperature,” according to the report, “has increased by 1.3°F to 1.9°F since 1895, and most of this increase has occurred since 1970. The most recent decade was the nation’s and the world’s hottest on record, and 2012 was the hottest year on record in the continental United States.” Over the next few decades, temperatures are projected to rise another 2°F to 4°F. By the end of the century, our average temperature could soar by 10°F if greenhouse gas emissions continue to increase unchecked. As a nation with over 95,000 miles of coastline, the report also addresses the issues of ocean warming and acidification. Written by over 300 NOAA scientists and endorsed by dozens of other experts from both the public and private sector (including two oil companies), the NCA concludes that, “Climate Change presents a major challenge for society.” It goes on to say, “There is mounting evidence that harm to the nation will increase substantially in the future unless global emissions of heat trapping greenhouse gases are greatly reduced.” While this comprehensive report does not offer policy, it does emphasize the urgent need for both adaptation and mitigation at all levels of government. Are you concerned about the quality of the air you breathe? Air pollution, a by-product of our modern age, is an ongoing problem in many parts of the United States. According to the American Lung Association’s annual State of the Air Report, 147.6 million people – 47% of the nation – live in counties with unhealthy levels of particle and ozone pollution. That is an increase of 16 million from last year. One of the worst polluted cities is Los Angeles, CA, where the air is considered unhealthy 120 days of the year, on average. For a list of the most polluted as well as the cleanest cities, click here. Particle pollution comes from a variety of sources, but chief among them are industrial emissions and vehicle exhaust. When these emissions react with the U.V. light of the sun, they form ground level ozone. Both of these pollutants are known to have serious negative impacts on human health. They especially affect individuals suffering from respiratory and cardiovascular diseases. While air pollution continues to be a serious challenge in this country, the report also notes the fact that our air – overall – is cleaner now than it has been in previous decades. This is largely due to the regulations put in place by the Clean Air Act. To check on the quality of the air where you live, click here. 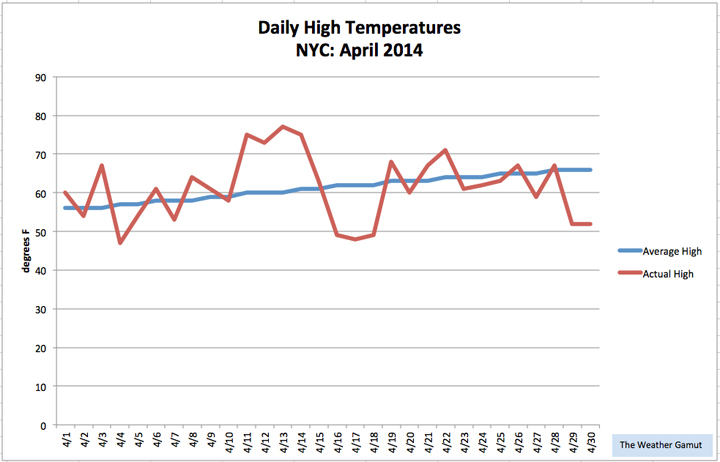 April 2014 felt like a weather roller-coaster in New York City. We had highs that ranged from a chilly 47°F to a balmy 77°F. All together, though, these extremes balanced each other out and produced an average monthly temperature of 52.3°F. That is only 0.7°F below normal. In terms of precipitation, April’s famous showers were intense this year. The city received a remarkable 7.85 inches of rain in Central Park. Of this impressive total, 4.97 inches fell in a single day – April 30th. According to the NWS, that is the 10th highest daily rainfall total on record for NYC. The Big Apple normally gets 4.50 inches for the entire month. The city also received a trace amount of snow this April. While this is normally nothing to get excited about, it is worth mentioning as it came on the heels of our warmest day of the year so far. What a month of extremes! April is famous for its showers, but yesterday’s precipitation was extreme. Torrential downpours brought New York City more than a month’s worth of rain in a single day. According to the NWS, 4.97 inches of rain was measured in Central Park. Not only is that a new daily record for the date, it was the 10th rainiest day ever recorded in NYC. On average, we normally get 4.50 inches of rain for the entire month of April. Up until yesterday, the city’s rainfall total was running below average for the month. So, while the rain was beneficial for the area, the rate at which it came down and its extended duration caused a number of localized flooding problems. Scientists say the frequency of extreme rain events like this one will increase as global temperatures rise and our climate changes.